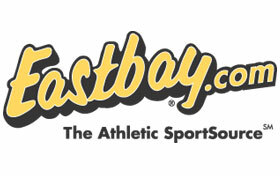 Shop at Eastbay, online at Eastbay.com, the source for all athletic goods. Easybay.com offers a huge selection of sporting goods, including sneakers, casual shoes, protective gear, sports equipment, fan gear, and clothing for training, baseball, basketball, football, running, soccer, volleyball, track & field, and other sports. Eastbay provides all the essentials from brands like Adidas, New Balance, Reebok, New Era, Puma, Oakley, Jordan, Converse, Nike, Volcom, Timberland, K-Swiss, The North Face, and more. But before you shop, be sure to grab all the savings with the latest Eastbay.com discounts, Eastbay promotions, and Eastbay coupon codes, found here at RetailSteal.com. Shipping prices for U.S. and Canadian orders depend upon the number of items ordered. Eastbay also ships internationally. Consult site for further information. Enjoy 10% savings on your purchase of $50 or more from Eastbay when you shop today. Use our code to receive this discount. Use this coupon code to save 20% on purchases over $99 at Eastbay. Click here. 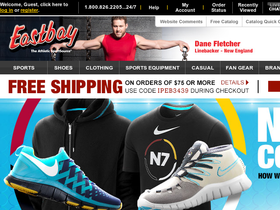 Spend $75 or more at Eastbay.com and use this coupon code for free shipping! Click link to shop and save. Save up to 70% on shoes, apparel, equipment and more at the Eastbay.com outlet. Click here to shop and save on Nike, Adidas, Reebok, Jordan, and other great brands. Save up to 35% or more on Nike Air Max at Eastbay.com- Click link to shop this limited time offer.